Whenever I’m developing recipes, I always try use inspiration from the fridge and pantry. 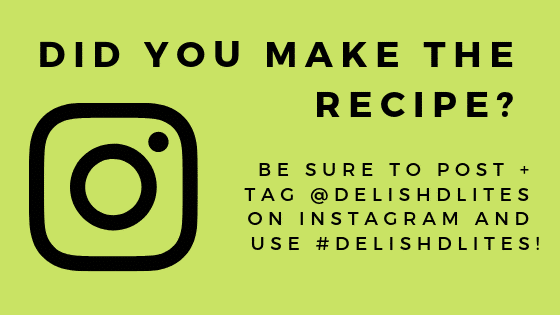 As I thought about putting together this recipe, it struck me that I had a delicious rotisserie chicken sitting in the fridge, and I instantly knew I had something good. The store bought rotisserie chicken is one of my MUST BUY items on my shopping list. They’re so delicious, and so versatile! Nowadays, these fully cooked protein powerhouses are so inexpensive, it hardly makes sense to a buy a whole uncooked bird. You’ll usually end up spending the same amount for an uncooked whole bird, so just save yourself the work and the trouble, and keep a rotisserie chicken in your fridge. 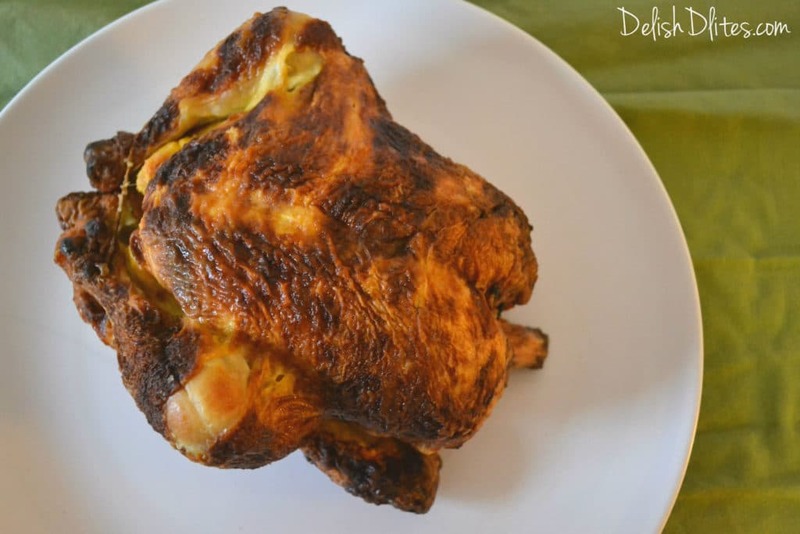 I’m going to develop a few recipes to highlight the versatility of the humble rotisserie chicken, here’s the first one! 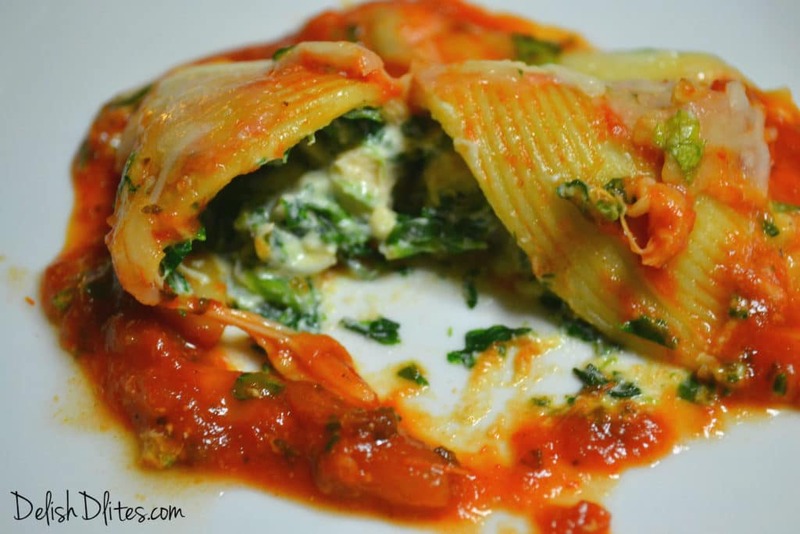 My chicken, ricotta and spinach stuffed shells are one of my most popular recipes, and it’s easy to see why! These stuffed shells are loaded with a creamy ricotta and spinach filling that’s studded with chunks of tender chicken breast. 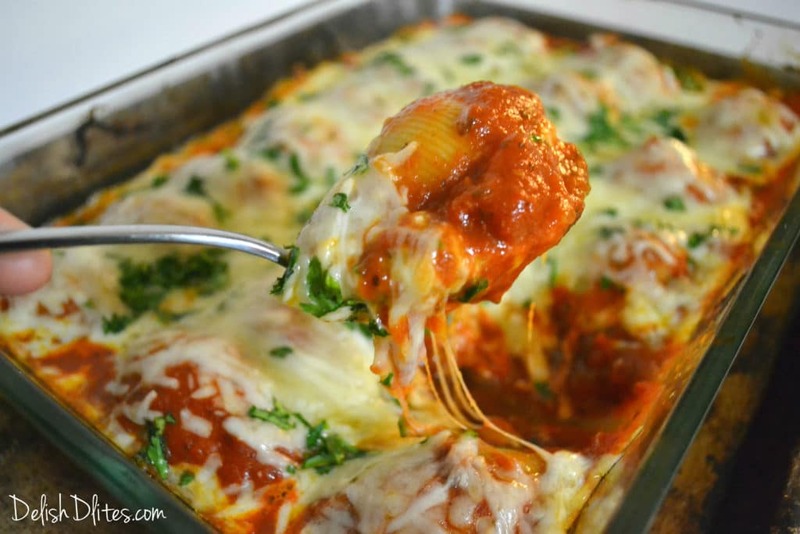 This is a great way to mix up your traditional stuffed shells recipe! 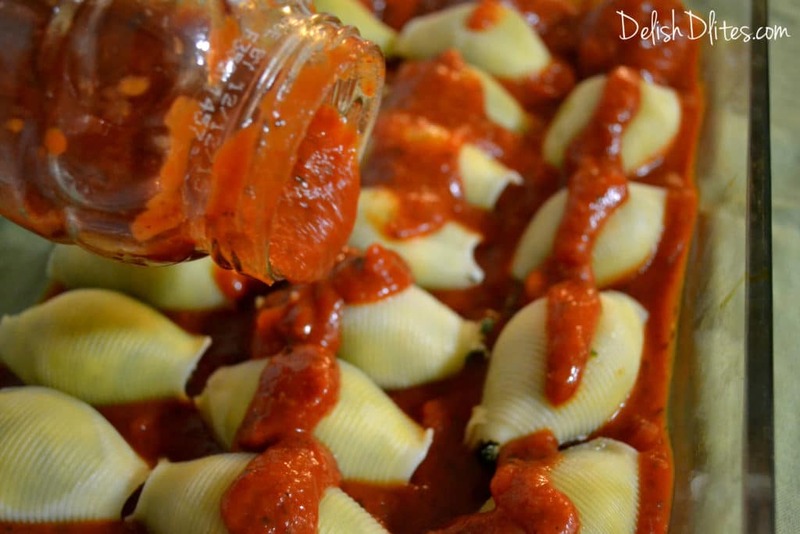 Cook the pasta shells for 3 minutes less than the box instructions, then drain and cool. The pasta will continue to cook in the oven. 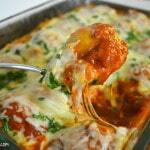 Pour half of the pasta sauce into a 9×13 baking dish, covering the bottom of the pan completely. Mix the ricotta, shredded Parm/Asiago, spinach, granulated garlic, chicken and half of the parsley in a bowl. Season with salt and pepper to taste. Add the egg into the seasoned mixture and stir to combine. Fill a quart sized plastic bag with the filling, then cut off one corner of the bag, to create a piping bag. Fill each shell with about 2 tablespoons of filling. 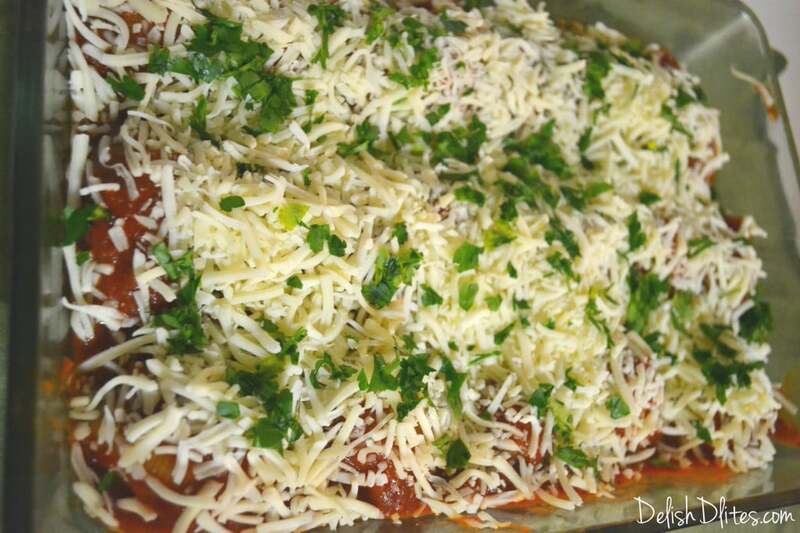 Place the stuffed shells seam side down into the baking dish. Top the shells with the rest of the pasta sauce, covering completely. 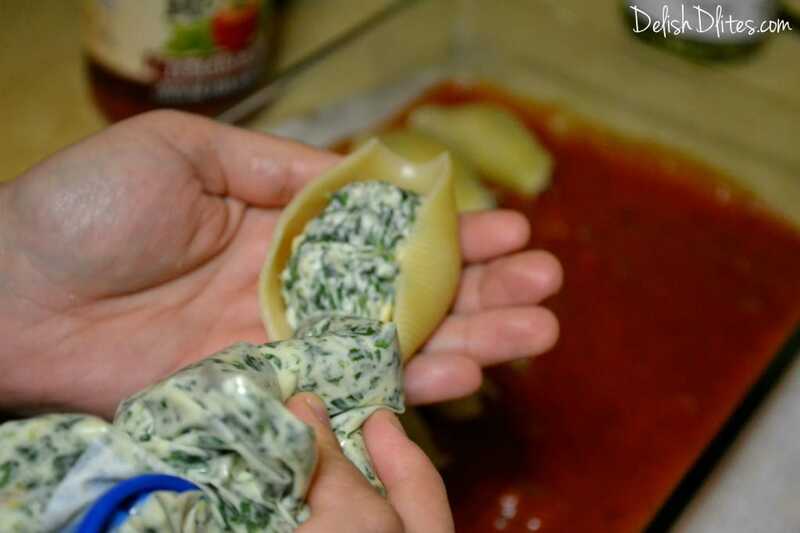 Top the saucy shells with 2 cups of shredded mozzarella, and the remaining parsley. Cover the baking dish with aluminum foil and bake at 350 degrees F for 20-30 minutes, until the shells are bubbling and the cheese is melted and gooey. You can always substitute cottage cheese if you like. Just drain it before use. 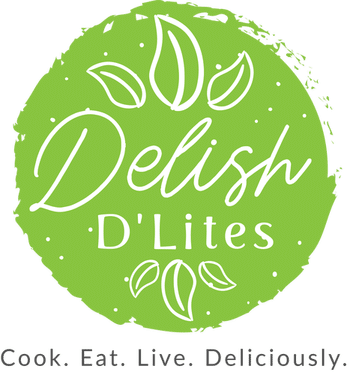 SO happy to have found your blog/website. I had the general idea but it always helps to have it in writing and the few ingredients I hadn’t thought of! Yummy! Thanks so much! That totally makes my day! <3 Happy cooking! Making this today. Looks so good!!! How many does it feed?!?!? Thanks Crystal! This recipe should easily feed 4, unless you’re in my household, then it’s more like 2 1/2 lol! I made this and it was soooo good! I think next time Im going to try adding mushrooms. I think it would go great. Thanks for the recipe.. My kids loved it. Such a great way of getting them to eat vegetables. That is absolutely fabulous to hear Cloreese! I’m so happy you enjoyed it! This sounds delicious. Will definitely try minus the chicken. I’m a pescatarian. Thanks Carmen! It’ll be just as delicious without the chicken 🙂 Lobster, crab or shrimp would be a great substitute, and you could add some seafood seasoning to tie it all together, seafood Alfredo style. Now, I’m gonna have to try that!